Nora and her husband, a young couple living in Italy, hire an older woman to help Nora through her difficult pregnancy. Once Nora delivers Emanuele, Mrs. A remains with the family to help care for the baby. Through the series of vignettes Mrs. A is shown as much more than a nanny. 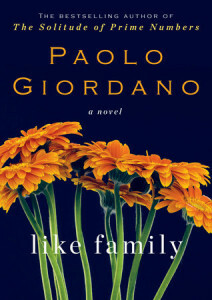 She helps the couple as they adjust to parenthood and she is almost like a grandma to little Emanuele. Just like a family member, sometimes she has strong opinions and sometimes it’s not all smooth sailing. When Mrs. A is diagnosed with cancer, the couple is shaken. They realize, even if they don’t quite voice it, how much of a profound presence Mrs. A is in their lives. When Mrs. A dies, and I’m not spoiling anything as you know this at the start of the novel, the couple is forced to look at their own interactions and see what is missing or if they can still change the direction of their lives. I found this to be a powerful novel that manages to capture so much about life and loss. It isn’t sentimental yet it did leave me with a very bittersweet feeling long after I turned the last page. Highly recommend it. This definitely sounds like both a powerful and emotional read. I wonder which direction the couple is going after Mrs A’s passing. I don’t think we ever truly appreciate how much someone means to us until they are no longer there. This does sound good, and I love the cover. Sounds like a good read! When I saw nanny I had visions of one of those awful obsessive nanny stories–so glad to hear this is so much more substantial! You liked this more than I did, I think. I only skimmed your review since I’m in the middle of composing mine! I just saw this one on another blog and now here too. This sounds very good. There seems to be a lot going on here and the book has some great reviews.